Whenever you read the word "moped" on this page, you can assume that it also applies to cyclemotors. The regulations are the same for an 18cc Lohmann as for a Yamaha FS1E. Autocycles, having engines greater than 50cc, not only have to conform to all these regulations, but more besides. In many countries the moped regulations are much less stringent than for full-sized motor cycles. However, this is not the case in the UK. Here a moped must be registered, MoT tested (unless it is MoT exempt) and covered by ‘third party’ insurance. The rider must have an appropriate driving licence and must wear a BS-approved crash helmet. Mopeds are not allowed to use cycle lanes. The only exception to this is for some electrically powered cycles. If they conform to the EAPC (Electrically Assisted Pedal Cycle) regulations - which means having pedals, a ‘dead-man’ cut-out and being within specific weight, power and maximum speed limits - then they are exempted from most of these regulations. Most of this is fairly straightforward; the bit that causes most problems with the old machines that are the EACC’s forté, is getting the moped registered in the first place. When you buy an old moped, the documentation that it comes with can range from a full set to nothing at all. Many cyclemotors even lost their registration plates when the original owner took the engine off so he could carry on using the bicycle. Occasionally lucky enthusiasts discover old mopeds that, for some reason, were never sold and languished for many years in the back of a shop; these would never have been registered. Similarly, an old moped bought in another country may have no documentation relevant to the UK. The registration procedure will depend on just how much paperwork comes with the moped. If there is a modern registration document (called a V5 or V5C) then all that you have to do is to follow the instructions on the V5 for change of ownership. The procedures vary according to when the registration document was issued so we will not attempt to list them here, check the instructions on the form or visit the DVLA Web Site for more information. Before using the moped on the road, the moped must be insured, tested and taxed. It might already have a valid test certificate and tax disc when you buy it. If there is no registration document but you believe it has had one (for instance: the vendor might tell you that he has lost the document) then you can apply for a replacement V5. Any vehicle that was first used in the UK since 1977 will have had a V5; older vehicles that have been used since 1983 will also have had a V5. The correct form to apply for a replacement V5c is a V62 and it can be downloaded from the gov.uk website. If the previous owner has taxed the moped or given a Statutory Off Road Notification (SORN), this does not transfer to you; you must tax it or declare SORN when you change the ownership. If you are not sure if your moped has been registered, it is possible to check on-line at: www.gov.uk/get-vehicle-information-from-dvla. If the check shows your registration number is now on another vehicle, the most likely reason is that the number has been sold by a previous owner. Your vehicle will have been given a new registration at the time the number was sold—follow the procedure as if the V5C is missing, explaining that you believe a different registration mark has been issued. Some vehicles do not appear on this check: if they have been out of use for a long time, thay may have been removed from the DVLA’s main database to a ‘skeleton’ record. For any UK vehicle registered since 1977 or used after 1983, apply for a replacement V5c using a V62 form. Contact us. Let us know about what vehicle you have and what documentation and we can advise youon what to do. If the moped has no V5 registration document but does its old card ‘logbook’. These are green or buff in colour and are numbered VE60 or RF60. Failing that, other pre-1983 documentation can be considered. Since May 2015, DVLA has changes its policy on this and an old tax disc or MoT certificate cannot be used as supporting documentation any more. However, if you have no suitable documents but are prepared to do a bit of research work, it may be possible to turn up some documentation. Originally, County Councils and County Borough Councils (Burgh Councils in Scotland) were responsible for registering motor vehicles. When a centralised, computerised registration system was introduced, much of the old paper documentation was destroyed. However, many local authorities had the foresight to preserve their original documents in the county archives or record offices. 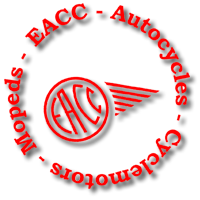 If you can track down the original registration records for your moped, a certified copy of the records can be used as supporting evidence to retain the registration mark. The first step in the process will be to work out which local authority first registered the machine; there’s a list in the Moped Archive to help you. Again, DVLA’s May 2015 policy change means that, to be accepted, this documentation must show a definite link to the vehicle (eg: frame number) and, in most cases, archive records will not have this information. Having gathered your evidence, and completed the V765 form, your application has to be sent to an authorised enthusiasts club for verification. The EACC is authorised to do this; the EACC charges a fee of £10 for this service. Note: for vehicles outside the EACC’s remit (cars, for example), a complete list of authorised clubs (called form V765/1) is available from the DVLA. If you have no suitable documentation, the moped can still be registered. It will be given an ‘age-related’ registration mark (ie: one that looks appropriate for the age of the moped) provided that you can supply evidence of its age. The evidence of age can be a foreign registration document in the case of an imported vehicle. For the rest, DVLA requires a statement from the vehicle’s manufacturer. Of course, many manufacturers have disappeared over the years, while others will no longer have information about vehicles they made long ago. If the manufacturer is unable to assist and the vehicle is over 25 years old, the DVLA will consider evidence from an enthusiasts’ club, like the EACC. We are able to determine the date of most makes of cyclemotor, autocycle and moped (and some other vehicles too) from details such as the frame and engine numbers. We charge a fee of £10 for this service. Changing ownership on a registration document or applying to retain a mark using a V765 can be done when you buy a moped. An application for a ‘age-related’ mark should be made when the moped is ready for the road. It needs to be insured and usually needs to be MoT tested (the matter of what registration mark to put on the MoT and Insurance certificates is overcome by using the frame number instead - these documents can later be endorsed with the new registration mark when it is issued). Nowadays, many insurance companies are reluctant to insure a vehicle that has no registration mark because they now run a national database on all insured vehicles. However, it can be done. But it is likely that your insurance company will specify a time limit within which you must notify them of the registration mark. So, be sure that everything is ready for the MoT before you insure your machine. Since April 2013, DVLA will not register a vehicle of 49cc or over that originates from outside the UK until an HMRC NOVA application has been complete to show that the appropriate VAT (if any) has been paid. Since 18 November 2012, cars and motor cycles built before 1960 are exempt from MoT testing. When taxing an MoT-exempt vehicle, instead of an MoT test certificate you will need to complete form V112. Pre-1960 cars and motor cycles are in exemption category O. This has been just a brief outline of the procedures. If you would like more information, need a dating certificate, or want a V765 form verified, then please get in touch us by e-mailing . The club charges £10 for issuing dating certificates and £10 for verifying V765 forms. Dating certificates remain valid for a year; out-of-date certificates can be re-issued for a fee of £5. These services are also available to non-members of the club at no extra cost. Enquiries about the EACC should be sent to .